NISOD was formed in 1978—meaning we celebrated our 40th year over the course of 2018! Though turning 40 may not be a milestone everyone eagerly awaits, there are so many wonderful endeavors and memories over the past four decades that NISOD is proud of and grateful for, so we are feeling pretty fantastic about 40. Here are NISOD’s three favorite things about turning 40 and a look back at how we commemorated this important landmark over the year. While most of us have grown up with community colleges in our backyards, they are a relatively new phenomenon in higher education, having evolved in the early part of the 20th century. Since then, community colleges have come to play an increasingly important and integral role in higher education. 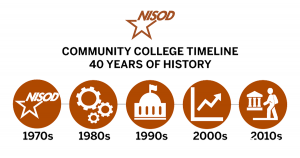 Take a look back on the timeline of 40 years of growth in community colleges we created to represent how the community college sector has progressed since the beginning of NISOD! Jerry Reed, Professor, Software Development, Valencia College (FL), revises his original student group project approach to fit the needs of today’s online class environment. Peter Barbatis, Vice President, Student Services and Enrollment Management, Palm Beach State College (FL), reflects on the changes made to new student orientations over the past 20 years. Russell Kunz, Professor, Business Management, San Jacinto College (TX), reflects on the minimal use of teamwork in college courses and offers ways to develop successful student teams. MAY 31, 2018: Innovation Abstracts from May 3, 2013, “Thought for the Week Wednesdays: Making Connections in Minutes,” by Emily Moore, Lead Instructor, Pre-Curriculum Reading, Wake Technical Community College (NC). JUNE 14, 2018: Innovation Abstracts from December 1, 2016, “Using a New Tool in a New Way,” by Lynne N. Kennette, Professor, Psychology, Durham College (Canada). JUNE 28, 2018: Innovation Abstracts from October 20, 2016, “What You May Teach Without Knowing It,” by Dale Schlundt, Instructor, History, Palo Alto College (TX). JULY 12, 2018: Innovation Abstracts from January 19, 2017, “Teaching Applied Education Courses Online,” by Jishnu Subedi, Faculty, Construction Project Management, Southern Alberta Institute of Technology (Canada). JULY 26, 2018: Innovation Abstracts from April 22, 2016, “How Students Can—and Should—Contribute to the Rubric Creation Process,” by Elizabeth A. Mosser, Assistant Professor, Psychology, Harford Community College (MD). AUGUST 9, 2018: Innovation Abstracts from February 19, 2016, “Strategies to Advance Learning Outcomes in the Non-Science Major Biology Classroom,” by Beena Patel, Senior Lecturer, Biology, Montgomery County Community College (PA). NISOD began when Dr. John Edward Roueche, the organization’s founder, discovered a need to identify and disseminate teaching strategies and tactics to community college practitioners. Dr. Roueche assembled an organization with the primary purpose of publishing solicited information about community college best practices. Dr. Suanne Davis Roueche served as NISOD’s director from 1985 to 2000. Under her brilliant leadership, NISOD’s membership went from 50 institutions to 750, and attendance at the annual conference went from 152 participants to approximately 2,000 upon her retirement in 2000. As publications editor, Dr. Roueche disseminated Innovation Abstracts to approximately 100,000 weekly readers. After stepping down in 2000 as NISOD’s director, Dr. Roueche continued to serve as NISOD’s editor until 2012 and as a senior lecturer in the Department of Educational Administration at The University of Texas at Austin. Dr. Roueche passed away in late 2017. NISOD looks forward to another 40 years full of great memories, people, places, events, and essays. Thank you to everyone who helped us to make the past four decades so inspiring, exciting, and powerful.